During India visit, Mahmoud Abbas praises terrorists, martyrs - but says he wants peace with Israel. Palestinian Authority Chairman Mahmoud Abbas during his trip to India praised "martyred" terrorists as well as the jailed terrorists who are on a hunger strike, calling them "heroes." "Today, we mark Nakba Day," Abbas said in his speech. "We will never forget the heroic prisoners sitting in occupying Israel's jails. These terrorists are fighting for freedom and honor." "I salute these people, I admire them, and I respect them. I promise, we will not rest until every prisoner has returned to his family with his head held high." 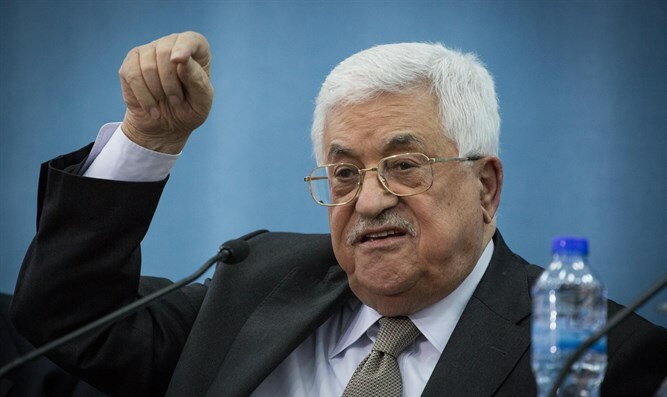 Abbas also called on the international community to pressure Israel into agreeing to the hunger-striking terrorists' "humanitarian, legitimate, and justified demands, as a preface to the prisoners' release, without preconditions, and without exceptions." Abbas' speech, which was translated and disseminated by MEMRI researchers, ended, "Praise be to our pure-hearted shahids (martyrs), and freedom to our heroic prisoners. Long live free and independent Palestine!" On Tuesday, Abbas told Indian officials that he "wants a state alongside Israel." "We are striving to implement the two-state solution....living in peace alongside the State of Israel," Abbas said. "We hope that the Israeli Prime Minister will accept this invitation to realize peace... We are ready and reach out in order to achieve the desired peace." Out of over 1,000 terrorists, 300 gave up the hunger strike after less than two weeks. In addition, arch-terrorist and strike leader Marwan Barghouti was caught secretly eating in his prison cell. Among other things, the hunger-striking terrorists demand more TV.